present “Once Upon a Parable” a biblical-based musical on Friday, July 20th at 6:30 pm. the wise man and the foolish man, the good Samaritan, the mustard seed, the parable of the vineyard, and the prodigal son, which is the centerpiece of the musical. Volunteers are needed. Please contact our Director of Music, Rich Barnett, for more info or to sign up: music@stlukerichmond.org. If you like to sing, or play an instrument, please join one of our choirs. Everyone is welcome to join. Previous musical experience is not necessary. Our music groups will begin rehearsals in the fall but new members can join at any time. The Adult Choir rehearses on Thursdays from 7:30-9:00 p.m. beginning on Thursday, September 3, 2015through to June 2016. Youth in high school are welcome to join the adult choir. This choir sings weekly at the 10:00 a.m. worship service and for special worship services from September through early June. The Handbell Choir rehearses most Thursdays from 6:30-7:30 and welcomes new members. Please contact Joe Bucher through the church office to discuss our Handbell Choir. St. Luke has a number of fine instrumentalists who join together periodically as an ensemble under the direction of trumpeter Calvin Vonada. 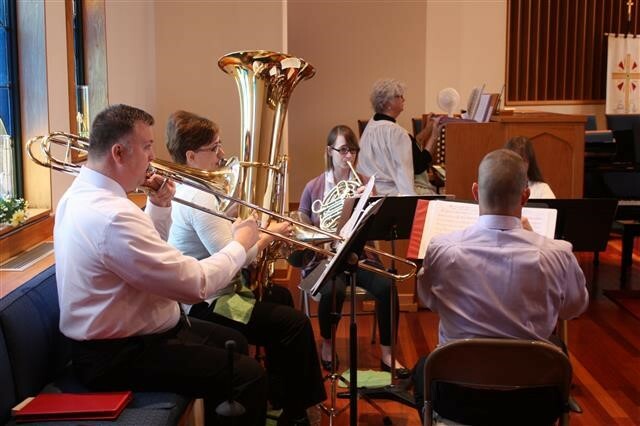 Those interested in contemporary music are welcome to join other instrumentalists to play on Youth Sunday, Rally Day and Un-rally Day, and other special services and social occasions. Children who are able to play instruments have occasions to do so during regular Sunday worship. We presented annual concerts in May – the concert for 2016 was actually on April 24, 2016 at 1:00pm, featuring largely classical music, with solos and ensembles and organ improvisations by our Pastor Fred Marcoux.